CHICAGO — Cedar Electronics has been selling CB radios to American truckers since the 1960s, helping connect the workers who keep the U.S. economy rolling. But these days Cedar’s business isn’t exactly trucking along. The Chicago-headquartered company is racing around Asia looking for other countries to host its manufacturing, after the radios Cedar makes in China and brings to the United States were hit with one of the Trump administration’s 25 percent tariffs this summer, making them more expensive to import. The White House’s decision to extend its tariff campaign to an even broader range of Chinese imports starting Monday is putting similar pressure on more U.S. companies to uproot their Chinese manufacturing, and to consider layoffs, price hikes and investment cuts. […]Cedar Electronics’ predecessor company was the first to introduce CB radios to the market decades ago. “We like to joke it was the first social media device,” Karnes said. The radios, made famous by movies like “Smokey and the Bandit,” are still used by many truckers, despite the advent of cellphones. Steven Fields, a trucker based in Kansas City, Mo., said he uses a CB to warn other drivers about bad weather and accidents. “Being prepared can make a big difference between a miserable trip and a safe trip,” he said. About 15 years ago, Cedar moved its manufacturing to China to save money on parts and labor, Karnes said. Cedar imports almost all of its Cobra-brand CBs to North America, where it holds almost 80 percent of the market. The radios are mostly sold at large truck stops, for $99 to $199, depending on the model. When Cedar learned its CBs would be included on the initial tariff list targeting $50 billion in imports, it applied for an exemption and imported additional inventory by costly airfreight to have stock on hand before the tariffs took effect. That gave the company enough CBs to meet demand through September without having to raise prices, Karnes said. Click here to read the full story and comment at The Washington Post. This entry was posted in CB, News and tagged CB, CB Radio, Cedar Electronics, Citizens' Band Radio, Cobra, Jeff McMahon, Washington Post on September 25, 2018 by Thomas. My dad was an avid CBer when I was a kid. He had an FCC-issued license and belonged to a healthy community of CBers in our part of the state. He had a beautiful yellow Robyn T-240D (same as pictured above) as a base station, and a mobile CB installed in every car. After the FCC dropped the licensing requirement, his activity on the bands slowed down although it did give me a chance to hop on. My best friend (who lived about 1/4 mile away) and I used to keep in constant contact with our 40 channel 5 watt CB walkie talkies. It was great fun. Of course, it was a treat when I would catch some “skip” and make contact with someone two states away with that same walkie talkie. Like it or hate it, a lot of radio enthusiasts and ham radio operators cut their teeth on CB radio. CB radio is still a pretty dynamic public radio space today. True, it’s a bit of a free-for-all and if you can’t tolerate profanity and “colorful metaphors” then you best stay away. You don’t need a CB radio in order to listen to the CB frequencies; most SDRs and many portable shortwave radios can tune in. If interested, check out this previous post: Listening to Citizens’ Band (CB) radio on your shortwave receiver. Post readers: Anyone still use CB radio today? Anyone else get their start in CB radio? Any stories you’d like to share? Please comment! This entry was posted in News, Nostalgia, Radio History and tagged CB, CB Radio, Citizens' Band Radio on September 11, 2018 by Thomas. “It was before mobile phones, before the internet. It was the initial form of mass communication, a way you could chat to your friends for free,” says David Titlow as we talk about CB Radio, the now-obscure 1970s and 80s technology. Click here to read the full article and enjoy Tidlow’s excellent photos. This entry was posted in Art, Articles, News and tagged CB, Citizens' Band Radio, UK on June 20, 2018 by Thomas. December 2nd was an unusual night for CB (Citizen’s Band) radio, as the band was open late (0030 GMT) when I turned on the President Washington CB radio just to see who was on. First stop was Channel 19 (27.185 MHz), the trucker’s channel, where the QRM was high, due to the skip from the many truckers on the channel. Earlier in the day this channel was very quiet as was the rest of the band. The fact that Channel 19 was pinning the S meter after dark was a big hint that the band might be open. And it certainly was! Being a CB’er from back in the 70’s (call sign KBN-8387), this band was my first serious introduction to two-way radio communication, and after 40+ years it’s still an enjoyable experience to listen in to the local, and sometimes DX chatter. For the most part the CB band mimics 10 meters, basically open during the day (except when sunspot numbers are low) and closed at night. That’s the usual drill, but Mother Nature doesn’t always go by the playbook and sometimes the band is opened at the darnedest times, sometimes even after midnight! So this evening around 8:30 EST the President Washington CB base station was fired up and CB operators were heard in Maine, Illinois, and as far as Wisconsin, definitely what would be considered out of the ordinary range of CB, which is generally several miles. Now FCC rules still state that it’s illegal to communicate over 155 miles but it’s a non-issue when the band’s open. For the most part, AM is used on most of the channels but you’ll find LSB activity on Channel 36 (27.365 MHz). And when the band gets busy and crowded, you’ll hear LSB QSOs from Channels 36 – 39 (27.365 – 27.395 MHz) as sidebanders spread out among the channels so that they can work each other through the QRM. To get a better idea of what the CB band “looks” like during a band opening, a spectral scan of the band (26.965 – 27.405 MHz) would be useful. This can be achieved using an SDR dongle, such as the RTL-SDR.com version which is a diminutive broadband receiver with an analog to digital converter and covers from about 26 – 1670 MHz. Used in conjunction with an up-converter (from Nooelec), software such as SDR# (SDR Sharp) and a computer (Smartphone apps are available also) you’ll be able to put up a spectral scan of the band as well as hear what’s happening. As the old adage goes, “a picture is worth a thousand words” so tonight the SDR dongle, along with SDR# software was fired up to get an idea of how many stations were on during the opening. The antenna used was an S9 43 foot vertical, the same one I use for HF. Using the dongle, it’s an easy feat to visualize the entire CB band on the spectral scan, which is a plot of frequency (X axis) versus signal strength (Y axis). The top half of the screen is the spectral scan and the lower half is the “waterfall” which is a time lapse recording of the spectral scan. Screenshot of CB Band (wide red stripe) during tonight’s opening. 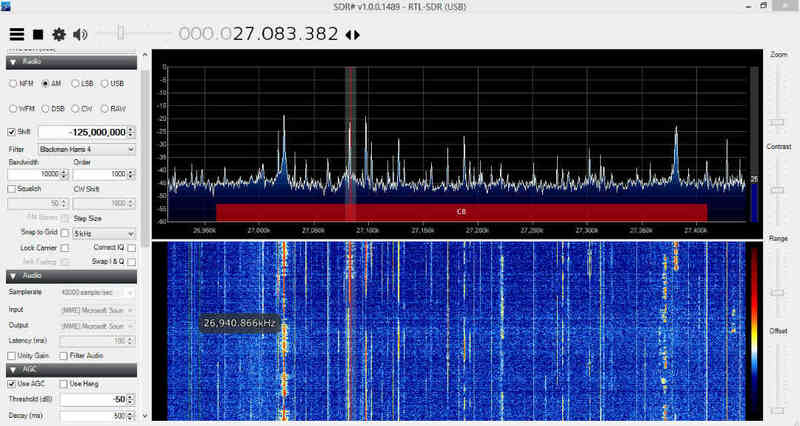 Normally at this time of night a spectral scan of the CB band would be flat-lining, but as you can see there are plenty of stations conducting QSOs, with the stronger stations having higher peaks and more intense tracings on the waterfall. Seeing the entire CB band visually gives one lots of information such as what channels are active, how many stations are on, what stations might be running higher power (limit is 4 W AM, 12W PEP SSB output), whether outbanders are active or whether DX stations outside the US are partaking of the opening. Over the years I’ve heard the CB band open beyond midnight and on a winter’s night during a snowstorm. Some openings have lasted for hours. Last year, using the mobile CB, operators from Europe, the Caribbean, and as far away as Australia were heard during my commute to work. At the opposite extreme some days all you’ll hear is ignition noise, hihi. It’s a lot like 10 meters and even a bit like 6 meters; you never know what surprises Mother Nature has in store. Spin the tuning dial over to the CB band and take a listen one of these days. Thank you so much, Mario! Only a few weeks ago, I noticed on my SDR’s wideband spectrum display that the 11 meter band was very active. I started listening around and was absolutely amazed at how organized some of the nets were and how reliable skip was. Signals were blanketing all of the eastern US and even into the west. Sometimes I think there are openings on the 10 meter band, for example, but there are so few users there in comparison, no one notices. The CB frequencies are pretty much always active, when conditions are favorable for DX, everyone instantly notices! Many might not realize that even their portable shortwave radio can tune the CB frequencies. Thank you again! This entry was posted in Articles, News, Software Defined Radio and tagged CB, Citizens' Band Radio, Guest Posts, Mario Filippi (N2HUN), RTL-SDR on December 9, 2016 by Thomas. React International coordinates emergency response via CB radio. Did you know that you may be able to listen to CB radio on your shortwave receiver? If you have a digital receiver that covers from 26.9-27.5 MHz, you can listen to CB frequencies in a matter of minutes. Below, I’ve posted a chart of all 40 CB “channels” and their associated frequencies. Why listen to CB radio? Entertainment value: hey, it’s CB–you never know what you may hear. In fact, note that CB listening isn’t for those who are easily offended by adult language. In the past, CB radioers were licensed by the FCC and tended to be (in my humble opinion) more courteous. Today, it’s a free-for-all, but you will still hear many regulars that are respectful and follow the “gentleman’s rules” of amateur radio. Simply tune to the frequency below and listen. Like broadcasters and some ham radio operators, CB is primarily an AM mode activity. Make sure your radio is set for AM (not SSB) listening. This entry was posted in Articles and tagged CB frequencies, CB Radio, CB Radio on shortwave, Citizens' Band Radio, Citizens' Band Radio Frequencies, how to find CB radio frequencies on September 19, 2011 by Thomas.